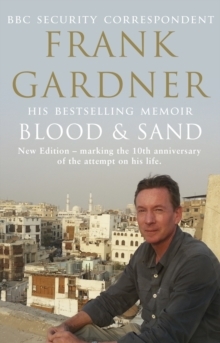 It was on 6 June 2004 that BBC security correspondent Frank Gardner and cameraman Simon Cumbers were ambushed by Islamist gunmen in a quiet Riyadh back street. Simon was killed outright. Frank was hit in the shoulder and leg. As he lay in the dust, a figure stood over him and pumped four more bullets into his body at point-blank range. Against all the odds, Frank Gardner survived. Ten years on from that horrendous attack, although partly paralysed, he continues to travel the world reporting for the BBC. His acclaimed, moving and inspiring memoir is now brought up to date with a new chapter recalling his return to Saudi Arabia for the first time since he was shot. This new anniversary edition is a reaffirmation of his deep understanding of – and affection for – the Islamic world in these uncertain times.